With the season in view, long-distance competitive shooters across the country are gearing up to see how far they can accurately fire a rifle. Each shooter spends countless hours preparing their rifles, scopes, rangefinders and loads for the year’s competitions. They are also fine-tuning their fundamentals, practicing breathing and trigger presses. The best, know the critical factors in accuracy such as load data, velocity, energy, and drop must be adjusted to include the intangibles at a location. These factors including weather conditions, altitude, and windage are required to shoot true at distance. Now, there are many ways to determine these factors and many shooters have perfected their form over years of training. However, the best and most efficient way, and a solution available to all shooters, is with a Ballistic Calculator. 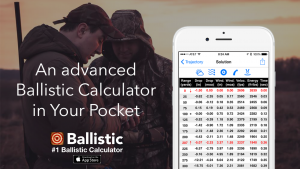 The industry’s premiere ballistic calculator solution is Ballistic. Ballistic is powered by the JBM Ballistics Engine, one of the most accurate ballistic engines available. Ballistic comes with a library of 5,300 projectiles and loads, along with performance data from both manufacturers and military testing. In addition, users are also able to upload their own ballistic data, making Ballistic ideal for handloaders. Ballistic will calculate bullet drop data specific to each load such as bullet weight, velocity, and ballistic coefficient. Once this data has been inputted, simply save the rifle/bullet combo to your favorites to be ready for each day at the range. Even better, Ballistic can be used on location to make the necessary adjustments to account for current weather conditions, altitude, and wind direction. With Ballistic, shooters can determine exact bullet placement out to any achievable distance with just a few clicks. Take the guesswork out of long-range shots and have the confidence to make every shot. Ballistic is available as a mobile application, making it portable and accessible anywhere, whether at the range or in the woods. This serious app for serious shooters can be downloaded from the App Store or at Ballisticapp.com.